Former Chelsea striker Didier Drogba scored a hat-trick on his first Major League Soccer start as Montreal Impact beat Chicago Fire 4-3. The 37-year-old made his debut as a substitute in a defeat two weeks ago. But on Saturday he scored one first-half goal, made it 3-3 on the hour and then headed the winner four minutes later. 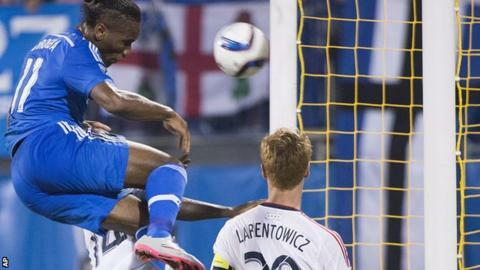 The former Ivory Coast international is the first player to get a hat-trick within his opening two MLS matches. Drogba, who is his country's all-time leading scorer with 65 goals in 105 international appearances, signed for Montreal in July after leaving Chelsea. Meanwhile, former Newcastle striker Obafemi Martins and ex-Fulham and Tottenham forward Clint Dempsey were the goalscorers for Seattle Sounders in a 2-1 win over Toronto.